This special bristle is Made in the USA and composed of 62% Castor Bean Oil and 38% nylon. These bristles are biobased, but still not biodegradable. Prior to the invention of nylon in the 1930s, pig hair was used for toothbrush bristles worldwide. Today, pig hair remains the only biodegradable option — and in today’s world it is a very controversial material. We hope you’ll support our brand as we push bristle manufacturers to develop better plant-based alternatives to nylon. This new bristle that we are now using is the best available option. All in all, we think our toothbrush is a “step in the right direction” because it results in less than 0.1 ounces of plastic waste (bristles), whereas the conventional plastic toothbrush is all plastic. If you would like to use a fully biodegradable toothbrush, pig hair toothbrushes are available online from other companies. However, pig hair bristles are very hard and stiff – something dentists do not recommend. Neem sticks are another option – they are the only fully plant-based and fully biodegradable alternative for oral care (we now offer neem sticks for sale on our website). We sincerely believe our bamboo toothbrush is the easiest switch. Note about other companies claiming to have “Biodegradable bristles”: please beware of these companies peddling unverified bristles. The bristles they are using, according to their own testing paperwork, are made from PLA, which is made from GMO-corn. We have spent years eliminating PLA from our packaging – the last thing we are going to do is put it in our bristles. The last thing we would want to put in our children’s mouths is a bristle made from GMO corn. Who certifies Brush with Bamboo’s bamboo as Organic? The bamboo used for our toothbrushes is Certified 100% Organic by CERES of Germany. Is Brush with Bamboo vegan? Yes all of our products are vegan: no animal testing, no animal parts. Only plant-based components are used. What is the compostable wrapper/bag made from? Brush with Bamboo eliminated the wrapper around it’s toothbrush in March of 2019. All toothbrushes are now packaged in a paper box only. Are your products certified or tested? 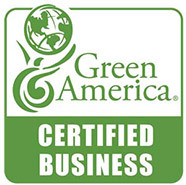 Yes, our toothbrushes and straws are tested and certified by third parties. For more information, see our Lab tests and certification page. Where is Brush with Bamboo made? Our toothbrushes are a Product of USA and China. Our special plant-based bristles are made in the USA. All other components are made in China. Click here to view photos of our team and operations in China. We’ve gone the extra mile to ensure safety: the toothbrushes are verified chemical-free and BPA-free by U.S. testing agencies. We also have a full-time American-managed team on the ground in China ensuring worker safety, cleanliness, and good working conditions. Given that you’re harvesting bamboo, what about panda welfare? We use Moso bamboo to make our brushes. Pandas eat 42 species of bamboo, but Moso bamboo is not one of them. So this type of bamboo is not food for pandas, nor do pandas inhabit the area where we harvest. What type of bamboo is used and is it sustainably grown? The type of bamboo used for our toothbrushes is Certified 100% Organic Giant Moso Bamboo, which is a bamboo timber. 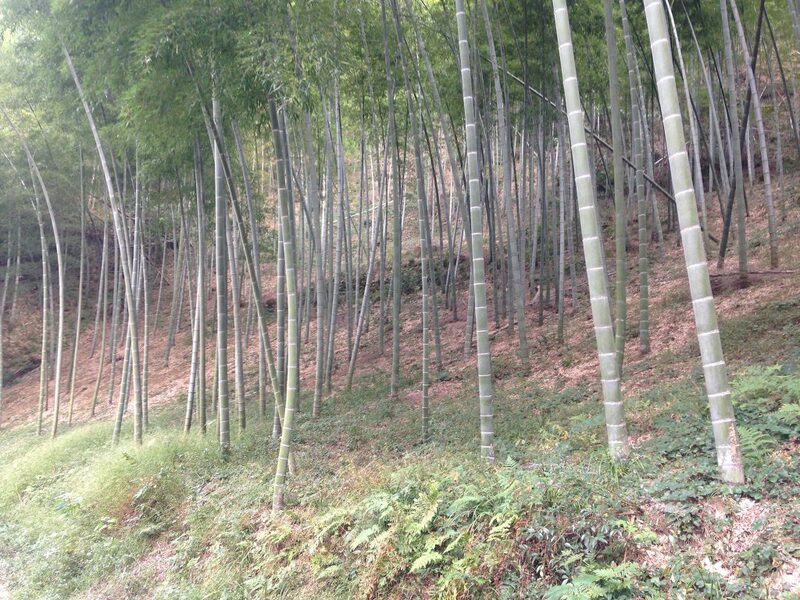 Our bamboo comes from a mountain range in South China where it grows wild – covering entire mountains. Accordingly, this is not farmed bamboo – it is wild harvested organic bamboo. No pesticides or fertilizers are ever used – in fact, it would be impossible to do so. Our bamboo is never even watered – it is entirely rain-fed. When a stalk of bamboo is cut to make toothbrushes, another bamboo stalk takes its place and grows to full length (50-75ft) in only 2 years! 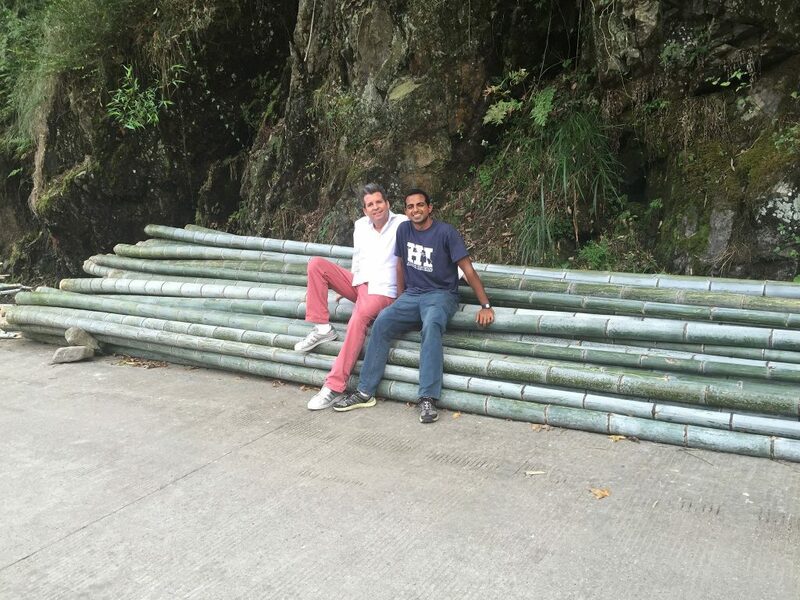 See Rich and Ro pictured with fresh organic bamboo below. This bamboo is boiled in pure water, then air dried, then carved into toothbrushes – that’s it. Just pure, natural, organic bamboo. Wild organic bamboo – never even watered. Only rainfed. The supply is so vast that we are barely using 1% of it. With 16 Billion plastic toothbrushes produced every year, bamboo toothbrushes are only 0.03% of the global supply. We could do with more bamboo, less plastic. Rich and Ro pictured. This bamboo will be processed into bamboo toothbrush handles. New bamboo shoots will grow to this size in just 2 years. All orders are shipped from our Los Angeles office in Diamond Bar, CA. For non-USA customers, import duty and taxes may be due when importing goods, whether by a private individual or a commercial entity. These charges, if any, are not included in the checkout total, and all such charges will be collected by local customs authority from the importer (you) at the time of delivery. What returns do you accept? We accept returns of products purchased on BrushwithBamboo.com. If you purchased your product from another retailer please return it to that retailer. If for any reason you are not 100% satisfied with your purchase made on Brush with Bamboo, simply return it we will happily credit your original form of payment. Please email us at info@brushwithbamboo.com or call at +1 909 265-4326. We are here to help you! Make sure to enclose a copy of your original invoice. Please select a shipping method that provides a tracking number and delivery confirmation, and keep a copy of these numbers for your records. Sorry – we can’t be responsible for lost returns. My product has a manufacturing defect, what should I do? We do our best to make sure each item is perfect, but occasionally there can be a glitch. After all, it’s a natural material – not plastic. If you have a quality problem with one of our products, please contact us at info@brushwithbamboo.com, or call us at +1 909 265-4326. If possible, please include a photo!